I concocted this tasty sauce when I was looking for a simple way to jazz up the typical weeknight chicken meal. Liberally coat a large sauté pan with oil spray, and preheat the pan over medium-high heat. Season the chicken breasts with the salt and pepper. Add the chicken breasts to the pan and cook for 5 minutes per side, or until cooked through. Transfer the chicken breasts to a plate. Recoat the pan with oil spray. Add the mushrooms and sauté for 8 minutes, or until soft and browned. Add 1.5 cups of the broth and the garlic powder. Bring the broth to a boil. Reduce the heat to medium-low and simmer uncovered until about half of the liquid evaporates, about 8 to 10 minutes. In a small bowl, whisk together the remaining 1/4 cup broth and the flour until fully incorporated without any clumps. Add the mixture to the skillet, along with the whipped butter, and continue to stir as sauce thickens. Season with additional salt and pepper to taste. Add the chicken breasts back to the pan and heat until warm. 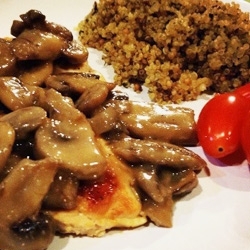 To serve, spoon the mushroom sauce over the chicken breasts.